Completely ground up custom developed website for Coffee Culture Cafe & Eatery. The folks at Coffee Culture approached us with a not-so-unique problem : their website was out of date, parts of it were broken due to outdated plugins and sloppy development work and it wasn’t integrated with their social media marketing efforts. The objective for this project was to balance several key design requirements from the client. They wanted to convey their European roots while still appealing to a friendly family atmosphere. The Coffee Culture project began as an refresh of a website that was an older and not mobile friendly. 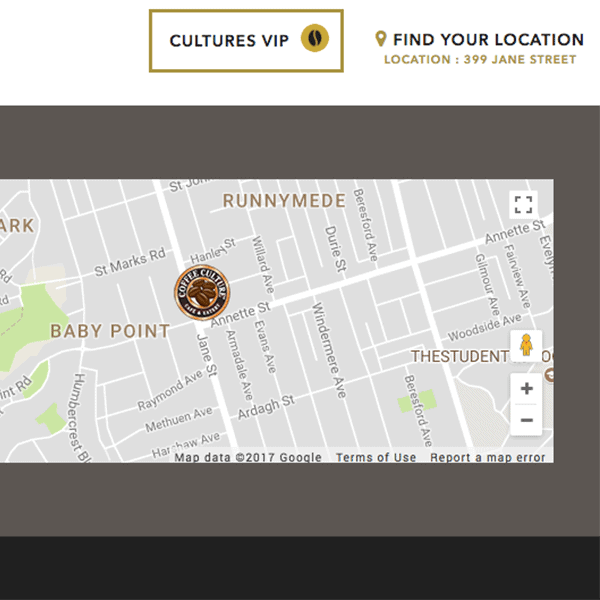 Coffee Culture is a coffee franchise with over 45 location across Canada. The client wanted a new website that represents the brands classic European feel, but also has a trendy and modern aesthetic. Coffee Culture has over 50 locations across Ontario, Manitoba and Pennsylvania. With number of locations is expected to grow in the near future, the client wanted us to implement a solution that would make it easy to match their geographic location to the nearest Coffee Culture cafe. Having this ability also would allow specific promotions to be showcased for any of the store locations. We decided to develop a custom WordPress plugin called Shift8 GEO IP Locaiton. Developing a solution in-house gave us complete flexibility to tailor the solution to meet the needs and expectations of our client. The plugin ultimately detects their location and sets the geo-coordinates as an encrypted browser cookie. We then developed custom code specific to the client to match those coordinates with the nearest store location based on address matching. With this solution, we were thinking long term. We wanted the client to have the option in the future to have a specific “My Store” dashboard where promotions, communications, specials and everything in between could be leveraged with each customer.